These are the books that I've added to my collection during February. As well as those shown below I also added two in one book Cheyenne Lance / Medicine Wagon by John Legg. A body is wrapped in a bloodstained horse-blanket and a farmer admits to the gruesome crime, but with good reason. Now the sheriff has to decide, does he arrest or protect the guilty man when eight men come looking to settle the score? And how will this impact on the town the sheriff has taken an oath to protect? This is a gritty story of judgment, consequence and the promise of retribution. It is also the story of one man – Sheriff Will Price – who is prepared to go raking hell to fulfil his pledge…. 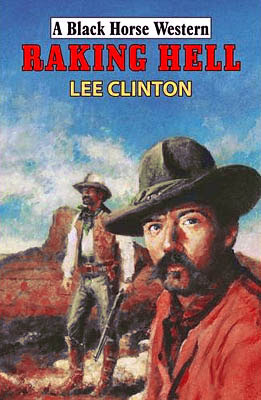 This is the first Black Horse Western from author Lee Clinton, and what an excellent debut it is. The book is much longer than many of Hale’s westerns due to the print being much smaller. The author tells his story in short, titled, chapters, each have a sub-heading too, which tells the date and time of day each chapter takes place. In fact the whole story takes place over a period of ten days. Lee Clinton hooks his readers from the opening scenes with questions such as why would the farmer admit to murdering the man he brings into town? How did he manage to kill his victim in such a gruesome way? Why bring the corpse to Will Price’s town instead of any of the other towns in the area? The book moves forwards at an ever-increasing pace, and as the above questions are answered, so the tale becomes a chase story. Will Price's desire to hunt down, and kill, his quarry, becoming fuelled by a promise and vengeance. The action is well described, and the killings savage, at times making me shudder – as I guess most men will when they read the way some of the deaths come about. The end sees Price challenged with yet another question; can he put aside his promise and see justice carried out by the law? This all leads to an exciting final showdown that ties everything up brutally. Let’s hope it’s not too long before another BHW appears from this author. Raking Hell has an official release date of February 28th, but it is available now from the usual Internet bookstores. For those interested in finding out more about Lee Clinton may I suggest you visit his website. Here you can read and listen to the first chapter. Award-Winning Tales is a collection of short stories, twenty-six of them. As you’d expect there’s a wide mix of writing styles and themes, from stories set in the old west to those set in much more modern times. There are tales based around the world of rodeo, murder, wild animals, gunmen, romance, discovery, and more. All these stories are extremely well written, many of which will remain in my memory for a long time. There are tales that are action packed, tales that spring surprises, and tales that hit hard at the emotions. Overall, these stories all make for one terrific western anthology. Most of the above names are new to me. I have one short story by just one of these authors, and that’s Jerry Guin, his story Likker Money appears in Robert Randisi’s White Hats anthology. Another neat addition to this book is that nearly every short story has a black and white photograph or drawing to illustrate it. At the end of each tale is a brief author bio. The title of the book, Award-Winning Tales, is self explanatory, but where exactly did they win their awards? The majority did so in Moonlight Mesa Associates own annual Cowboy Up contest – details can be found here for this years competition, which opens on March 1st 2011. As far as I understand it the book should be available now, in both paperback and ebook form. A portion of all sales will be donated to a charitable cause. Twelve years ago, newspaperman John Bryce saved an innocent man from the hangman’s noose. That man was Matt Jensen. In gratitude, Matt gave Bryce four gold nuggets and told him, “If there’s ever anything I can do, just let me know.” Now, that day has come. As editor of the Fullerton Defender, Bryce has become the target of a powerful – and ruthless – English lord. A feared master duelist, his aim is fixed on the Dakota Territories. His weapons are intimidation and violence. And his hired guns are the most sadistic and deadliest prairie rats Matt Jensen has ever known…. Having read the first book in this series I had fully intended to read each new one as it came out, something I failed to do due to having so many books and not enough time…. Reading this, the sixth in the series, I wondered if it’d contain any spoilers for those I have yet to read, and as far as I can tell it doesn’t. The book is written well, making for a very enjoyable read. There’s plenty going on to keep the reader interested from beginning to end. The author uses the technique of switching from one set of characters to another effectively, giving the reader a number of different threads to follow, that, of course, all come together eventually. Throughout the book the action and tough talk is neatly balanced by many humorous moments, be they through words or incident. The story is filled with memorable characters, such as Lord Denbigh, hired assassin Meacham, and the small killer Butrum, all these, and others, proving to be challenging adversaries for Matt Jensen. 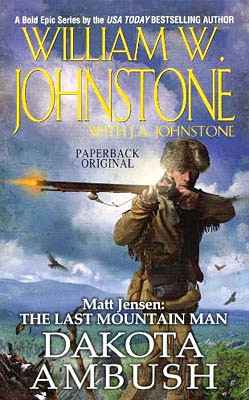 Matt Jensen doesn’t appear that much in the story’s first two hundred pages or so, instead the author uses these pages to develop his plot and characters, making the reader anticipate the arrival of Jensen and the justice he will surely bring with him, and when he does arrive the action moves up a gear. The final shootout is both tense and surprising, bringing everything to a very satisfying conclusion. Reading this makes me really wish I had managed to find the time to read the other four books. It seems Gideon has taken ill with cholera, and the whole town is at risk of infection. While a lovely lady doctor tries to control the crisis, Longarm sticks around in case Gideon lives – so he can watch him hang. But Gideon’s not the only crook in Panamint, and Longarm’s preparing for an outbreak of lead. 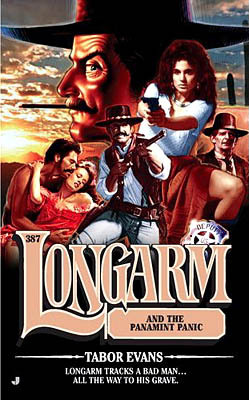 The author of this entry into the long-running Longarm series sure knows how to build suspense into a story. Just why don’t the people of Panamint want him to enter their town? What secret could they be hiding? A good portion of the book is given to these puzzles and this all makes from some excellent reading, a great gripping plot thread that grabs the reader and makes the book difficult to put down….or at least it would do if the reader hasn’t read the blurb from the back of the book which I’ve included above. I’d imagine this kind of giveaway must rankle with the author somewhat. Even though the spoiler blurb does take some of edge away from the mystery of Panamint the reader will soon find himself asking more questions, wondering what else is going on, as the author adds twist after twist to the fast moving and action packed tale. The story builds extremely well to its dramatic climax that provides the answers to all the plot threads and left me hoping it isn’t too long before this author writes another book in this series – Tabor Evans this time being James Reasoner. As a young man, Ben Hollinger hunted down and killed the outlaw gang who murdered his family. He now lives a very different life as the marshal of a sleepy cattle town. But his hopes for a peaceful future are shattered when he kills a young troublemaker who has forced him into a gunfight. The boy’s father, Nate Thornton, owns the biggest ranch in the territory and he puts a bounty on Hollinger’s head. Violence sweeps the town as every local gun-hand tries to hunt Hollinger down to claim Thornton’s bounty. His only hope for survival is an alliance with the rancher’s daughter, Cordelia, but will she really be prepared to side with the man who killed her brother? The shooting of Billy Thornton happens very early on in this story and from then on this book is virtually one action scene after another. As the bounty hunters and opportunistic gunmen gather and make attempts on Ben Hollinger’s life, so he is forced to hide. This, in turn, sees the lawman decide to sneak on to Thornton’s property to try and arrest the rancher. With Thornton, Hollinger, and a few others trapped in a room in the ranch house, Bill Shields provides some excellent, and very tense, reading. Overall, this is an extremely well flowing, easy to read book. Shields paces the story perfectly, building to the final showdown smoothly. Descriptions and characterizations are handled expertly and I was soon wondering how Cordelia would decide which side she should support. 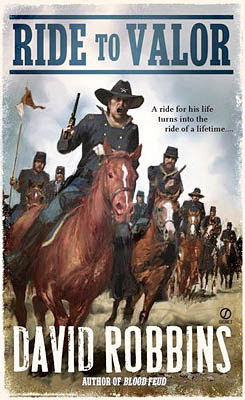 Bill Shields is a new author name to me and to Black Horse Westerns. On the strengths of this story I hope we will see more books carrying his name. 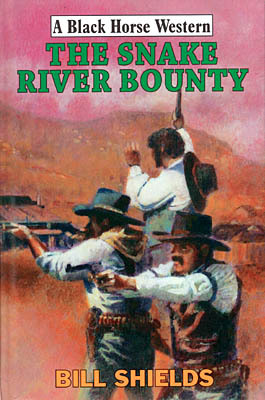 The Snake River Bounty has an official release date of the last day of this month, but is available now from the usual Internet booksellers. The badlands of Texas, 1861 – where death is a heartbeat away. When Fargo comes across five wagons and a mess of corpses, he gets caught up in a mission to rescue four young ladies from being attacked by rampaging Comanche warriors. The stakes are high, because one of the girls is the daughter of a maniacal army colonel. But when the Trailsman discovers the horrible truth behind the bloodshed, he is forced to face off against friend and foe alike…. 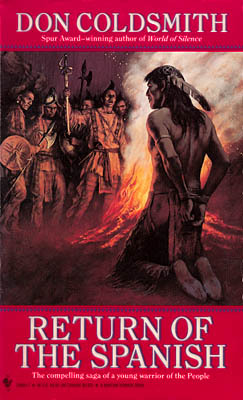 This book starts off like a straightforward western storyline of an Indian massacre and then of freeing their captives. 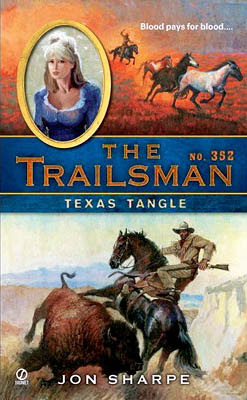 But this is a Trailsman tale, and long-time readers of this series know things will change rapidly. Here we have a Colonel who doesn’t want to head out to find his daughter, would prefer for someone else to do it. Why? Then there are the captives themselves, these girls coming over as the worst characters of all, one being particularly evil. Makes you wonder if they deserve rescuing. The book is filled with gritty action, quite brutal at times. Fargo dishing out some savage treatment, such as the finger shooting incident – not that the victim of this doesn’t deserve it. The dialogue is equally as tough, often injected with bittersweet humour. Fargo’s control of his temper is pushed to the limit as he attempts to return the girls to the safety of the fort – somewhere not all want to go. It isn’t long before Fargo wants to dish out some vengeance of his own, over the simple crime of having his guns stolen and wanting to retrieve them. This leads to a dramatic and violent final shoot-out that sees Fargo taking on a number of foes single-handedly. Once again the author (in this case David Robbins writing as Jon Sharpe) has produced a Trailsman book that fans of his, and this series, should not miss. When Pat Calhoun rides into town he steps straight into the line of fire – and from that point onwards things only seem to get worse. Why has a gang of owlhoots gathered to cause trouble? Is there a connection to the Civil War and the man who betrayed him? Pat’s only way of finding out is to ride straight into the outlaw nest…. Events build to an epic showdown as Calhoun comes face to face with his past above the raging Coyote Falls. Coyote Falls is Colin Bainbridge’s second Black Horse Western, the first being Pack Rat. Reading Coyote Falls certainly made me wish I’d read his previous book too, which I have in my collection – so many books and not enough time to read them all. Colin’s Bainbridge gives the reader a book absolutely jam-packed full of incident and lots of intriguing characters, some of whom may or may not be who they say they are. One of my favourites has to be the strange woman living alone in a ghost town…just what is her story and what part will she have to play in the outcome of this tale? Pat Calhoun has an unusual pet, a cougar called Cherokee, which is the cause of panic when they both stroll into a saloon for a beer. Shortly after that the book contains an attack on the town that many authors would have had as their final shoot-out, here it leads to many more tense and exciting action sequences. The story contains mystery threads too, as the reason for the gathering of outlaws is kept secret from hero and reader. Then there are those hints that some of the characters might not be all they seem, and what of the strange message passed on to Calhoun? All these elements effortlessly hooked this reader and made me not want to put the book down until I’d found out the answers. Hale have picked a superb cover for this book as it does illustrate a scene from the story. Coyote Falls is officially released at the end of the month but should be available now from Internet bookstores. Going home is not always as easy as it sounds, as Rafe and Seth Laramie discover when they fall foul of an angry posse. Mistaken for a pair of bank robbers, they are forced to flee a hail of bullets and hide out in the town of Greybull. There, they encounter the enigmatic Mort Sangster and use his cunning to slip away from the posse unseen. But all is not as it seems. When the Laramie brothers follow Sangster to his cabin, they find themselves amongst outlaws who are plotting an elaborate crime. The outlaws invite the brothers into the fold…but what bloody battles lie ahead if they choose to go along for the ride? Jack Sheriff starts this book like a straightforward story of a case of mistaken identity, one that you expect to follow the path of the Laramie brothers then having to prove their innocence. But the author soon has you wondering as to just what is really going on as the story begins to twist as the plot becomes more mysterious as questions come to light, such as who is really behind the outlaw activity, and just what crime are they planning. As more characters are introduced so the plot deepens. Jack Sheriff writes in an easy to read style that flows smoothly, ever increasing in pace as the book builds to its finale. His descriptive passages are very visual and the actions scenes gripping. The twists to the tale prove to be strong hooks, and you’ll soon be wondering who’s going to double-cross whom. Surprisingly, for a Black Horse Western, there aren’t any major roles for women, not that I’m saying they should be included in every story. In fact not having some love interest came as a welcome change. 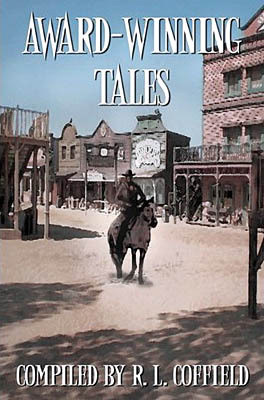 Jack Sheriff is one four pseudonyms used by John Paxton Sheriff for his Black Horse Westerns, and this book is officially released at the end of this month, although it should be available now from the usual Internet sources. Strong Bow was famous for his proficiency with all the weapons in the People’s arsenal. His long muscles could propel an arrow with deadly accuracy into a buffalo, a tree stump, or a lizard’s eye. But the young brave was eager to prove his skill on his people’s enemies and to capture the highest glory – death in battle. In the summer of 1720, the Spanish would give him his chance against the French and their relentless Pawnee allies. But as Strong Bow will soon discover, the price of pursuing the warrior’s way can be even greater than death…. Like many of the books in this excellent series this tale is about the discoveries of new lands and the people that inhabit them, but this time Don Coldsmith adds the fear of mistrust. This latter is mainly brought about by the language barrier as few of the different tribes, and the Spanish, are able to talk to each other and even less are able to speak with sign language. Body language and actions are misinterpreted and this, mixed with arrogance, gives the whole story a sense of tension that makes for gripping reading. How Strong Bow is saved from instant death is beautifully thought out but this doesn’t mean he is free, the shadow of death still hangs over him. Coldsmith creates a wonderful group of characters that each want to deal with Strong Bow in their own ways, each held to a stalemate by the others. Strong Bow is eager to escape and gets his chance…. but I won’t reveal more as this will certainly spoil the book for anyone intending to read it. Don Coldsmith ends the story with a question that I can only hope is answered in the next book. In fact this question had me reaching for the next novel immediately…. Return of the Spanish is another story that shows why this series is held in such high regard by so many. This book begins with a number of different incidents, some of which provide some excellent laugh-out-loud scenes and dialogue, that introduce the reader to the various characters that will play both major and minor parts within this story. Readers of the previous three books will have met many of these people before. I must admit to being quite surprised as to how many were killed off when Davis and his gang go on the rampage in LaQuesta and the surrounding area. As the Davis Gang hopelessly outnumber Brubs and Willoughby they need help to achieve their mission of revenge. 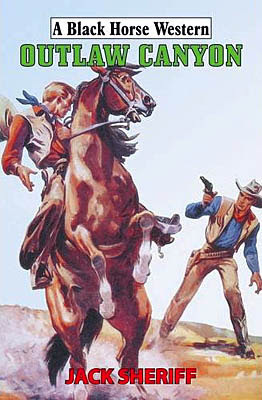 Gene Shelton brings this about by having them team up with another band of horse thieves (who throughout the series have stolen horses from each other on numerous occasions), which adds to the mix mistrusts and the fear of double-cross even though both groups have agreed to set their differences aside until they’ve wiped out the Davis gang. Once everyone arrives at the Devil’s Deathbed the book becomes one long and well-described gunfight that proves to be exciting, hard-to-put-down, reading. The aftermath of this battle seeing the surviving members of the two horse thief gangs attempting to outwit each other when dividing up the spoils of war. 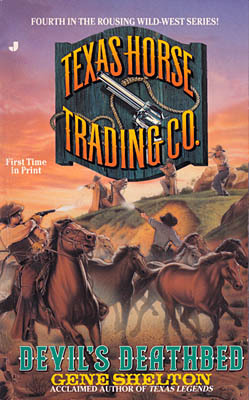 With Brubs and Willoughby’s return to LaQuesta, Gene Shelton has a couple of intriguing developments waiting to add change to his heroes lives, changes I would like to read more about but sadly won’t be able to as Devil’s Deathbed turned out to be the final book in the Texas Horsetrading Co. series. Devil’s Deatbed proved to be an excellent conclusion to this very entertaining series that provides a wonderful mix of action and humour throughout. Recommended. James Doyle is just another Irish boy in the Five Points slum of New York City until his father dies. In the struggle for survival, James is schooled in violence as a member of a street gang. And like many a boy, he makes some wrong choices and ends up on the run from the law…. But no one can flee forever. When James lands in more trouble, a judge gives him a choice: Go to prison or serve in the army. Soon James is sent west as a raw recruit in the cavalry, and he discovers enemies more brutal and dangerous than any found back home: the Cheyenne, the Kiowa, and the Sioux. This book is somewhat different to the majority of westerns published today, for two reasons. The first being that the main part of the story is about the Indian Wars: Cavalry v Indian. The second being that David Robbins tells a tale that covers more or less the whole life of James Doyle: Life to death – I say more or less as James is a young boy when we first meet him. Due to the length of the book time has to pass quickly in some places but we share all the life changing moments in James’ life. We share his happiness, sadness, achievements, mistakes, and ambitions. We see how each of these effect his later life; such as how he reflects that the companionship of his fellow soldiers is not that different to his friendships made during his earlier years as a street gang member. David Robbins prose is very readable, often painting vivid images within my minds eye. Who will be able to forget the scene with the buffalo? The action, and there is plenty of it, is first rate and often brutal, at times quite graphic in description. Dialogue crackles and includes many humorous lines. The story is told in short chapters that encourage the reader to just read another couple, and then another, so before you know it you arrive at the last page. For fans of David Robbins’ work this is a must read. For those who like cavalry v Indian stories then this should be on your reading list. 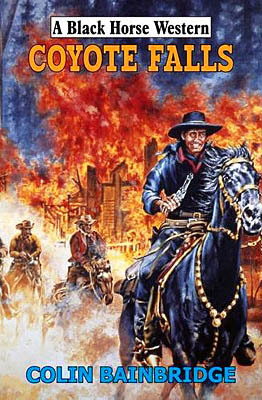 And for those of you who just enjoy well written, action packed, westerns then I would recommend this to you too.